Sailing in the Vendee | dingies, sailboards, land yatchs, kite surfing. Sailing in the Vendée. 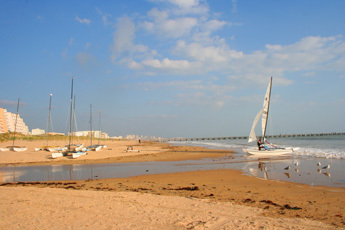 The Vendée has 146 kilometres of coastline and many inland lakes and rivers, and it offers a wide range of conditions for the many differing forms of sailing. Whether one is an exponent of wind surfing, dingy sailing, sand yachting, kite surfing or someone who just likes to sit around and watch others, the Vendée will not be a disappointment. It is no coincidence that the Vendée is home not only to the world’s most prodigious single handed yacht race, the Vendée Globe, but also to France’s two largest yacht manufacturers. Little did Benjamin Beneteau know back in 1884 when he first started manufacturing fishing boats, that one day his firm would be the world’s leader in the manufacture of sailing boats. Today there are 5 factories in the Vendée producing his boats. The second largest manufacturers of yachts are Jenneau, and their boatbuilding is centred on Les Herberies & Cholet. All along the Vendée coast there are harbours and most have marinas full of all manner of craft, showing the scale and diversity of the Vendéen sailing heritage. The 7th Vendée Globe starts 10th November 2012. Bruno Retailleau, President of the Vendée Council officially launched the seventh Vendée Globe at a press conference organised on Wednesday at the Paris Boat Show. The Vendée Globe 2012/2013 will set sail from les Sables d’Olonne on Saturday 10th November 2012 at 1400hrs GMT and already looks like being a vintage edition. With two years to go to the start, twelve sailors have already announced their intention of taking part. Dinghy Sailing. From Optimist dinghies to Hobie catamarans, wherever there is water one will find dinghies, and there are several places where they can be hired. Of course if you are able to bring your own dinghy you will be overwhelmed with places to sail and the extra cost of transporting the boat may well be offset by not having the expense of hiring a dinghy. We know of nowhere where a launching fee is charged. Apart from the sea where there are endless places to launch your dingy there are many lakes where you can sail. Hiring and or lessons for Dingies, Catamarans and sailboards are available at. Sailing School Sion sur l'Ocean, Point plage. 02 51 55 13 12. Plage de Bouil. Longeville-sur-Mer. Tel. 02 51 33 42 46. Centre Loisirs NautiqueVie, Plage du Lac, Apremont. Tel. 02 51 55 23 85. Club Sport et Nature, Ave de l'Ocean, Barbatre. Tel. 02 51 39 80 91. Base de Voile Camping, Le Lac Rochereau. Tel. 02 51 40 40 97. Ecole de Voile les CatMarins. 9, Impasse Blois, L'Epine. Tel 02 51 39 11 12. Ecole de Voile les Perles, 1,rue Louis Brien, l'Epine Tel. 02 51 39 71 99. Base Nautique, Base de Loisirs, Lucon. Tel.02 51 29 04 18. Centre de Voile. 24, Rue Cloucq de Vieil, Noirmoutire-en-Ile. Tel 02 51 39 13 83. Ecole de Voile,27 Ave G Clemenceau, Noirmoutier-en-l'Ile. Tel.02 51 39 32 62. Cercle Nautique, Boulevard de l'Egality, St.Gilles-Croix-vie Tel.02 51 54 09 31. Ecole de Voile. Plage de Boisvinet, St.Gilles-Croix-de-Vie. Tel.02 51 54 89 00. Station Bleues Atlantiques, Bouv Egality, St.Gilles. Tel 02 51 26 81 50. Ecole de Voile, Ave Estacade St.Jean-de-Monts. Tel. 02 51 58 00 75. Wind surfers. From beginners to wave jumpers there is somewhere to suit all abilities and genres of this wide and varied sport, with the diversity of conditions available one should have no problem in finding a location to suit one’s particular level of expertise. For those who want to take up the sport there are schools where you can take your first lessons, and for those who are slightly more advanced these schools offer the opportunity to refresh and advance previously learned skills. Off shore cruising: For those who want sail bigger boats either self skippered charter or with a captain, the Vendée with is glorious coastline has both the venues and the companies to offer either, whether it be for an hour or two a day or longer. The main centres for this are St.Gilles-Croix-de-Vie, Les Sables d'Olonne, Noirmoutier-en-l'Ile. Agrcoseil Nautique, St gilles-Croix-de-Vie. Tel. 02 51 54 30 50. Sablaise Nautique,Port Olona, Les sables d'Olonne. 02 51 32 62 16. Semvie Boating.Tel. 02 51 60 11 11. Sand Yachting. The vast stretches of beach here in the Vendée are ideal for this activity and the beaches around Saint-Jean-de-Monts, Saint-Giles-Croix-de-Vie and Les Sable d'Olonne are notable for this exhilarating sport. Char a Voile des Olonnes Grand Plage,Les Sables d'Olonne. Tel. 06 83 35 19 93. From 1st may till15th June. Club Nautique. Base des Vallees, St.Hilaire-de-Riez. Tel. 02 28 10 88 02. Wind Force Vie. 31 Quai Gorin. St Gilles. Tel. 02 51 60 02 58. Assoc. Nautique de Bourgenay. Plage Veillon. Tel. 02 51 22 02 57. Char a Voile Longevillais. Plage du Rocher. Tel.06 79 02 33 55. Kite Surfing was born from the cross-breeding of surfboards and kites, and provides a fascinating ballet of multicoloured wings and spectacularly gymnastic movement. It is possible to practise this sport though it seems that most places demand that you are in possession of the appropriate licence. Assoc. 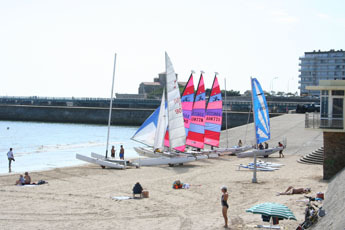 Olona kite club, Les Sables d'Olonne. Tel. 02 51 23 58 72. Bret-Kite School. 5,rue des Poiriers Bretignolles-sur-Mer. Tel. 06 60 99 47 33. Tel. 06 24 33 45 95. Parascending. For those that want the thrill of hanging from a paracute while being towed by a boat, parascending is available at, Les Circaetes, Les Sables d'Olonne. Tel.06 09 80 28 70.